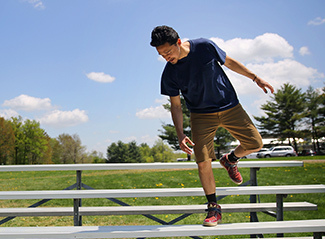 Home > News and Events > Andrew Figueroa's "Mixed-Race Mixtape"
Andrew Figueroa is done with his Division III capstone project, and now he’s taking it on the road. As the primary writer and performer of Mixed-Race Mixtape, Figueroa has been refining the piece since he first performed it as part of his Div III project in October. The plot of the piece follows the main character, Fig, as he navigates through life, portraying his interactions with his family, friends, lovers, peers, educators, and police. “This show follows Fig answering the question of ‘Who am I to me?’ That’s the only thing that matters. There are so many institutions and people, systems that are coming at Fig from so many angles, pressuring him to choose, or telling him what he is, and it makes it really hard for him to stay grounded in his authentic self,” Figueroa says. Figueroa’s refined project features a new cast of musicians, recomposed music, and a rewritten script. The cast recently performed a 15-minute segment at the Multicultural Theatre Conference at Amherst College in April. For now, Figueroa is focusing on promoting the show through social media while juggling dates and place for performances across the country.